The little big things. . . This week I had a stark reminder about what’s important in this life; What’s truly worth our attention, our thoughts, our time. On Wednesday morning, Amanda crossed my mind: “I should text her and see how she’s feeling”… but as sometimes happens in the hustle of my morning routine, I let the thought slip away without action. Thursday morning I heard the shocking news. Amanda passed away on Wednesday evening during transport from our small community hospital to a larger medical center. She was a healthy 38 year old mother of four. Her husband, who was following the ambulance in their family car, said goodbye to her on the side of a snowy back country road. As I work to process this horrible week: “Is this real?” “Amanda’s not really gone, right?” “How did this happen?”- I am realizing some ultimate truths that I vow to now keep ever present in my life. It’s the little things in life that are actually the big things. We have a tendency to give copious amounts of attention to certain parts of life (namely wealth, possessions, status, and power) that can actually be a distraction to our true work here on Earth (which I believe is simply to serve others so that you may leave more in this world than you received). Today’s culture makes these big things in our lives by reinforcing the idea that without accumulating them, success cannot be achieved. Consider, for a moment: What would you like your legacy to be? What is it about yourself that you would like to live on- long after your time here on Earth? For most, this legacy doesn’t include mention of possessions, wealth, status, or power. It is not these that people long for more of in their final days. Rather- it is life’s little things that are truly important: connections with others, building relationships, quality time, spreading love. These are what matter at the end of the day. Not having power, wealth, or prestige. Not being the best, fastest, or strongest. If we want to be the best at something this week, this year, in this life: let’s be best at the little, big things. Be the best parent. Spouse. Friend. Colleague. Teammate. LOVE. Be the best at that. How can we intentionally focus on doing the little things best in our classrooms? Value process over product. Shift your focus away from the products your students produce. Focus less on the grades they earn and the assessment scores they acquire, and instead, place it on to the process of learning. Then work to replace the traditional school norms and systems that tell students it is grades and not learning that is most important. Spend time with your students. Get to know your students as learners, yes – but also as people. Spend time with them in an effort to foster true, meaningful relationships. Check out @lauriesmith1995 ‘s amazing reflection on relationship building and the idea of seizing each opportunity we have with our learners. Show students their value. Help students see the value they bring to this world. Provide learning opportunities that highlight your students’ strengths (not their weaknesses). Authentically build their confidence by reminding them of their unique value and just how much they matter. Amanda was intentional in her work here on Earth. She looked me in the eyes when she talked to me. She never rushed through our conversations. She spent quality time building relationships. She loved hard and served others relentlessly. Love and serve others with intentional focus and you will find success. Is that a Twitter in your hand, son? Have you ever felt so ‘out of the loop’ that it paralyzed you? Today’s endless buffet of new learning tools, approaches, devices, and apps combined with intuitive and convenient ways to connect and share with others is certainly exciting. I worry, though, about the risk of paralysis that comes with being out of one’s comfort zone. We certainly know the benefits of time spent outside of our comfort zones. It is said that this is where the true learning, or “the magic” happens. 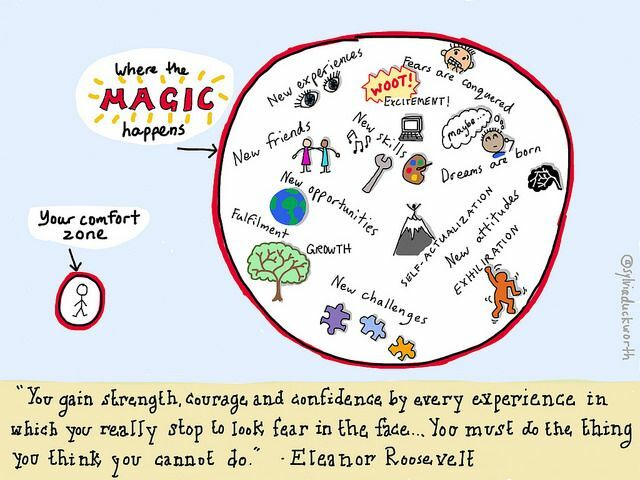 This, of course, makes sense – as the safety of our own comfort zones does little to push the limits of our learning. Although I’m typically excited to leave my comfort zone, to try new things, and to explore how new ideas might fit into my current schemas and practices, I do sometimes feel so ‘out of the loop’ that it paralyzes me. Not to mention, that putting yourself out there while simultaneously trying something new can be very difficult. For me, too much new at once can cause Action Paralysis. This was my first week participating in a large Voxer community (if people even call it that). The group I joined (EduMatch, created by Sarah Thomas & introduced to me by #DitchSummit) is made up of educators from all over the country (and maybe the world) who share stories and resources, ask questions, debate and discuss, and connect with one another. Although nothing about the group is all that scary in reality, the unknown of public Voxer etiquette combined with the task of sharing my unrehearsed ideas with a large group of strangers, paralyzed me. I actually sat for a full 3 minutes with my thumb hovering above the ‘talk’ button before my first Vox. Select Tools Intentionally. Not every new tool or app is for you. Know your personal learning targets and thoughtfully choose the tools that help you reach specific goals. Just as we thoughtfully integrate tech based on, not what is new and shiny, but what will truly amplify our teaching (@HollyClarkEdu), we must choose the learning tools that will truly enhance our professional growth. Reduce overwhelming thoughts by selecting tools because they amplify your personal learning, not because you feel you should try something new. Explore in Safety. Give yourself the time and space to explore new apps and tools in a risk free zone. Ask a friend to ‘figure it out with you’ or create a mock or test account before going live. Before joining a larger Voxer community, I began using the tool with a colleague. This allowed me to get comfortable with its features and learn the nuances of the app. Next, we began using a Voxer group to connect our staff in a in between face to face meetings. While these baby steps didn’t take away all of my anxiety around contributing to a larger public group, they did allow me the confidence to eventually do so. Set a Time Goal. Set time goals for yourself when it comes to exploring a new tool. Just like children must try a new food hundreds of times before determining an accurate opinion of it, you too must allow yourself the time to gain comfort and skill with a new tool. Increase the likelihood of providing yourself that time by setting parameters around your learning. Commit to “10 minutes a day on Twitter for three weeks” or “blogging once a week for three months” before making a determination about whether or not the tool is a good fit. Allow Yourself GRACE. Shift your goals from pursuing perfection to garnering growth. Perfection is a myth that hinders risk taking and stalls authentic growth. Rather, it is the process of making mistakes – trying and retrying that feeds our creativity, determination, and inspiration. Allowing ourselves the grace to grow gives us permission to play in the unknown and sets us up for contributing what only we can where it is needed most. I’ve spent the first few days of the new year pondering my #oneword2018 choice. This is my first time participating in a #oneword selection, and I want my choice to be intentional (I love the idea of setting clear intentions for the new year), meaningful, and memorable. Last week our 18 month old burnt his hands on our gas fireplace. That night, after finally getting him to sleep, I wept. Tears of fear, and sadness, and lots of guilt. How could I have let this happen? What kind of parent doesn’t have the fireplace guard on during the coldest day of the winter? I should have been closer, paying more attention, more diligent. Enter: G R A C E – My 2018 #oneword choice. 1. We all need it. We need grace. Grace from God, grace from others, and grace for ourselves. None of us (nope, not one) are perfect. Our intentions for the year ahead will occasionally fall short. We may not always bring our A game. We will fail. In 2018, istead of focusing on our inadequacies & guilt, let’s commit to embracing our imperfections, celebrating our failures, and granting ourselves grace. If you and I are in need of grace, then others in our lives are as well. This means our friends, students, colleagues, administrators, community members – and even our enemies – are all in need of the grace of others. Why not be the one to offer it in 2018? What makes grace a wonderful (and sometimes difficult) gift is that, by it’s very nature, it is given to the undeserving. The students, colleagues, and strangers that come into our lives in 2018 will, at some point, be undeserving of our grace. They will yell, say rude things, refuse to listen, whine, and break their promises. They will argue with us, ignore us, and give us less than their best. It is in these moments, when grace is needed the most. Consider how wonderful and unexpected a gift of grace (kindness, courtesy, & clemency) would be in these circumstances. 3. Grace is the cousin to empathy. Empathy, the ‘Not So Secret’ key ingredient to being an innovative educator (and all around good person), sets the stage for grace. It is empathy that fosters thought patterns of love and equity. It is only with an empathetic heart that we can consider offering grace to those around us. 4. Grace is not a free pass. Offering grace to others (and to ourselves), does not equate to handing out free passes for any behavior. Instead, it opens the door for ourselves and others to try again. Consider a violent student or a negative colleague. Grace says “let me understand”, not “I agree with your choices”. The same is true of ourselves. When failure and disaster strike in 2018, grace says “this happened, but it doesn’t have to happen again”; “This does not define you”. Grace opens the door to a fresh start, another try, a next attempt.